The Transformer is the worlds leading automatic folding scooter. It comes with a remote control that allows you to fold and unfold the unit at the touch of a button, automatically. It features a new and improved frame design, automatic motor system, as well as a new sporty body design. It is equipped with an airline approved lithium-ion battery that weighs only 4lbs, bringing the total weight of the unit to 55lbs. It also features a new ergonomic steering wheel with speed control, horn, and a battery charge indicator. There is also on on-board button to automatically fold the Transformer in the event you don’t have your remote control with you. The unit can also be folded and unfolded manually. If added stability is on your checklist, the Transformer is a perfect fit. 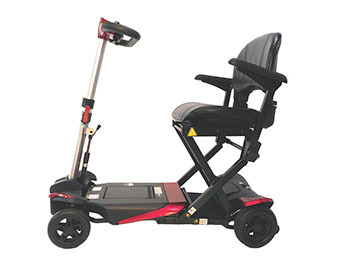 It is a true four-wheeled mobility scooter, providing added stability over traditional three wheeled mobility scooters. So don’t let mobility challenges stop you from doing the things you enjoy doing. Like going shopping, to museums, amusement parks, family gatherings, traveling or just being able to have more independence. Experience more with the Transformer. Please visit us or contact us now to purchase or if you have any questions about our mobility scooters.